The Senate voted 69 to 27 Monday to pass a bill that empowers states to collect sales taxes from Internet purchases. Under the bill, states could require out-of-state retailers to collect sales taxes when they sell products over the Internet, in catalogs, and through radio and TV ads. The sales taxes would be sent to the states where a shopper lives. Current law says states can only require retailers to collect sales taxes if the merchant has a physical presence in the state. That means big retailers with stores all over the country like Wal-Mart, Best Buy and Target collect sales taxes when they sell goods over the Internet. But online retailers like eBay and Amazon don't have to collect sales taxes, except in states where they have offices or distribution centers. 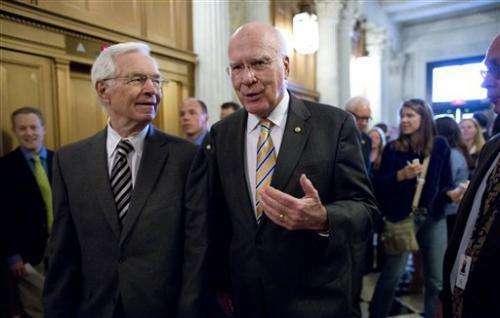 "This bill is about fairness," said Republican Sen. Mike Enzi, the bill's main sponsor in the Senate. "It's about leveling the playing field between the brick and mortar and online companies and it's about collecting a tax that's already due. It's not about raising taxes." The bill got bipartisan support in the Senate but faces opposition in the House, where some lawmakers regard it as a tax increase. Grover Norquist, the anti-tax advocate, and the conservative Heritage Foundation oppose the bill, and many Republicans have been wary of crossing them. Supporters say the bill is not a tax increase. In many states, shoppers are required to pay unpaid sales tax when they file their state tax returns. However, states complain that few taxpayers comply. "Obviously there's a lot of consumers out there that have been accustomed to not having to pay any taxes, believing that they don't have to pay any taxes," said Republican Rep. Steve Womack, the bill's main sponsor in the House. "I totally understand that, and I think a lot of our members understand that. There's a lot of political difficulty getting through the fog of it looking like a tax increase." Republican House Speaker John Boehner has not commented publicly about the bill, giving supporters hope that he could be won over. Republican Rep. Bob Goodlatte, chairman of the House Judiciary Committee, which would have jurisdiction over the bill, has cited problems with the legislation but not rejected it outright. "While it attempts to make tax collection simpler, it still has a long way to go," Goodlatte said in a statement. Without more uniformity in the bill, he said, "businesses would still be forced to wade through potentially hundreds of tax rates and a host of different tax codes and definitions." Goodlatte said he's "open to considering legislation concerning this topic but these issues, along with others, would certainly have to be addressed." Internet giant eBay led the fight against the bill in the Senate, along with lawmakers from states with no sales tax and several prominent anti-tax groups. The bill's opponents say it would put an expensive obligation on small businesses because they are not as equipped as national merchandisers to collect and remit sales taxes at the multitude of state rates. Businesses with less than $1 million in online sales would be exempt. EBay wants to exempt businesses with up to $10 million in sales or fewer than 50 employees. "The contentious debate in the Senate shows that a lot more work needs to be done to get the Internet sales tax issue right, including ensuring that small businesses using the Internet are protected from new burdens that harm their ability to compete and grow," said Brian Bieron, eBay's senior director of global public policy. Some states have sales taxes as high as 7 percent, plus city and county taxes that can push the combined rate even higher. Many governors—Republicans and Democrats—have been lobbying the federal government for years for the authority to collect sales taxes from online sales. The issue is getting bigger for states as more people make purchases online. Last year, Internet sales in the U.S. totaled $226 billion, up nearly 16 percent from the previous year, according to government estimates. States lost a total of $23 billion last year because they couldn't collect taxes on out-of-state sales, according to a study done for the National Conference of State Legislatures, which has lobbied for the bill. About half of that was lost from Internet sales; half from purchases made through catalogs, mail orders and telephone orders, the study said. Supporters say the bill makes it relatively easy for Internet retailers to comply. States must provide free computer software to help retailers calculate sales taxes, based on where shoppers live. States must also establish a single entity to receive Internet sales tax revenue, so retailers don't have to send it to individual counties or cities. Opponents worry the bill would give states too much power to reach across state lines to enforce their tax laws. States could audit out-of-state businesses, impose liens on their property and, ultimately, sue them in state court.